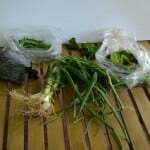 I missed a week with my CSA because we were in Florida. I was very sad but the awesome people at Goodness Grows made up for it by giving us a whole organic chicken for the week we missed! How awesome are they? 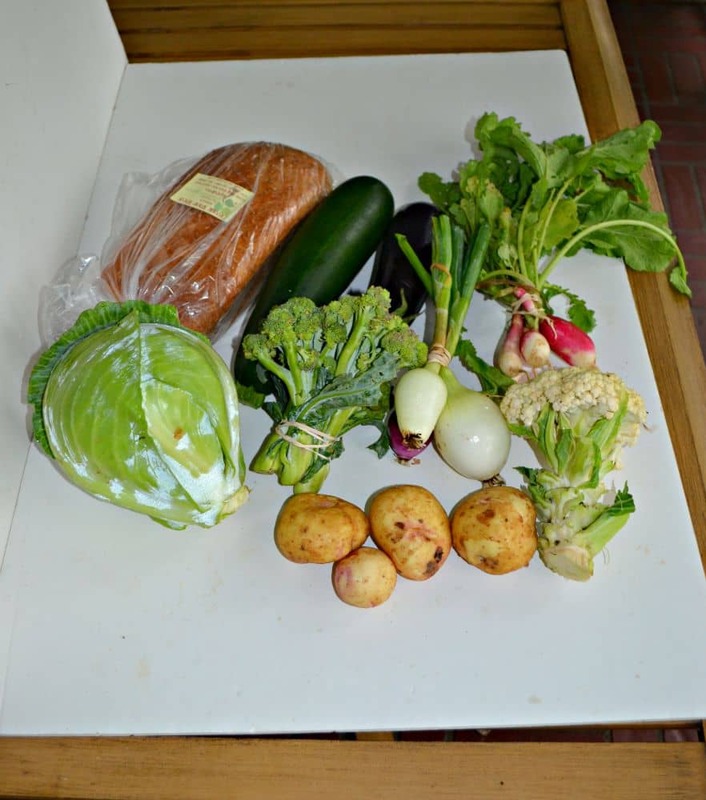 So this week we received a loaf of bread (which we used for sandwiches), a head of broccoli and a head of cauliflower (which I used to make roasted veggies), radishes for salads, a pint of potatoes, a zucchini, and eggplant, onions, and cabbage. 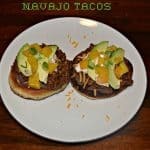 I was excited to use the onions and cabbage in a tasty taco recipe. I have a love/hate relationship with fish. Growing up my dad took me fishing a lot and I loved it. It was so fun being out in the canoe or stand on a bridge and fishing with my dad. I would bait my own hook and sometimes I even took the fish off of my hook. Most of the time we would throw our fish back but occasionally we’d bring them home and mom would cook them. To be honest, I’m not sure I ever ate them when she cooked them. Fish wasn’t something I grew up eating. We really never had it for dinner unless we went fishing. My dad would always get fish when we went out to dinner but I never did. So as an adult I never ate fish until I met my husband. He introduced me to tilapia which is pretty mild. I’ll eat it fried or baked with some seasonings. One of my favorite ways to eat it is in fish tacos. Recently my husband introduced me to cod. He said it was another mild white fish so I agreed to give it a go. Again, I wanted to cook it in a way that I knew I’d like it so I made fish tacos again. However, these are no ordinary fish tacos. I saw this recipe on Cook’s Country a few Saturdays back and as soon as I saw the pickled onions and cabbage on top I was sold on the dish. Plus, truth be told, I’ve never had a recipe from America’s Test Kitchen that didn’t come out well. 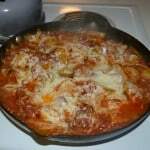 They are my go to for recipes. These fish tacos have several components so it’s a little complicated to make. The good thing about it is the pickled onions and cabbage can be made ahead of time and refrigerated to save time when cooking dinner. I also made the white sauce in advance. The white sauce is basically a sour cream mixture with some garlic, lime juice, and seasonings. It’s pretty tasty on these tacos. The fish is cut into strips then beer battered and fried. I never fry my fish is several cups of oil like I should so my fish never turns out quite as crispy as I’d like. I usually pan fry my fish in a few tablespoons of oil. In this case it works just fine because after frying the fish goes into the oven to keep it hot and crisp. The finished fish tacos rock! 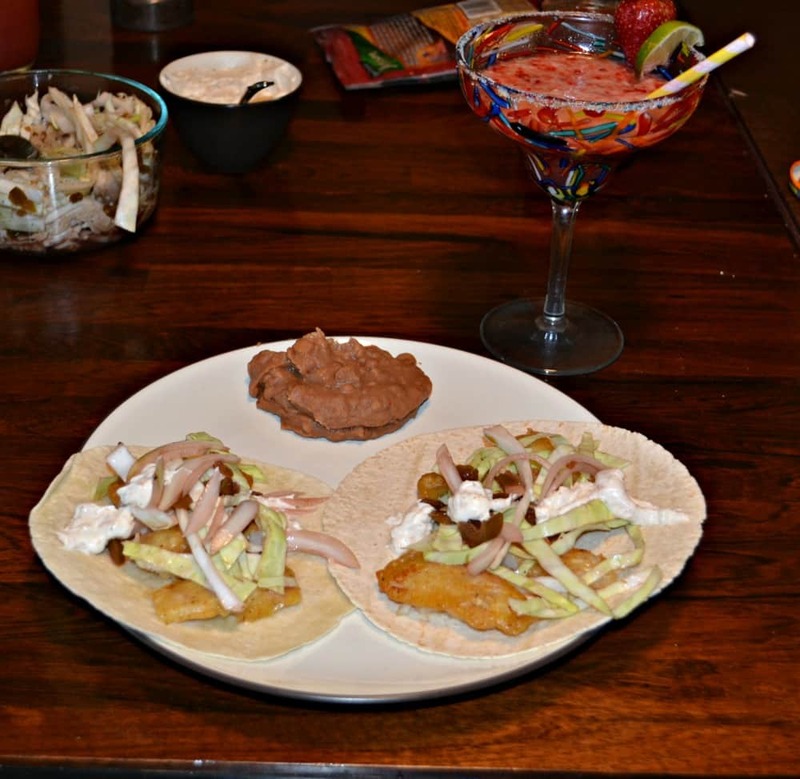 The crispy beer battered fish strips topped with crisp pickled onions and cabbage then drizzled with the creamy white sauce is a fresh and delicious taco. This is a great way to introduce fish to anyone who isn’t sure whether or not they might like fish because it’s such a flavorful taco. 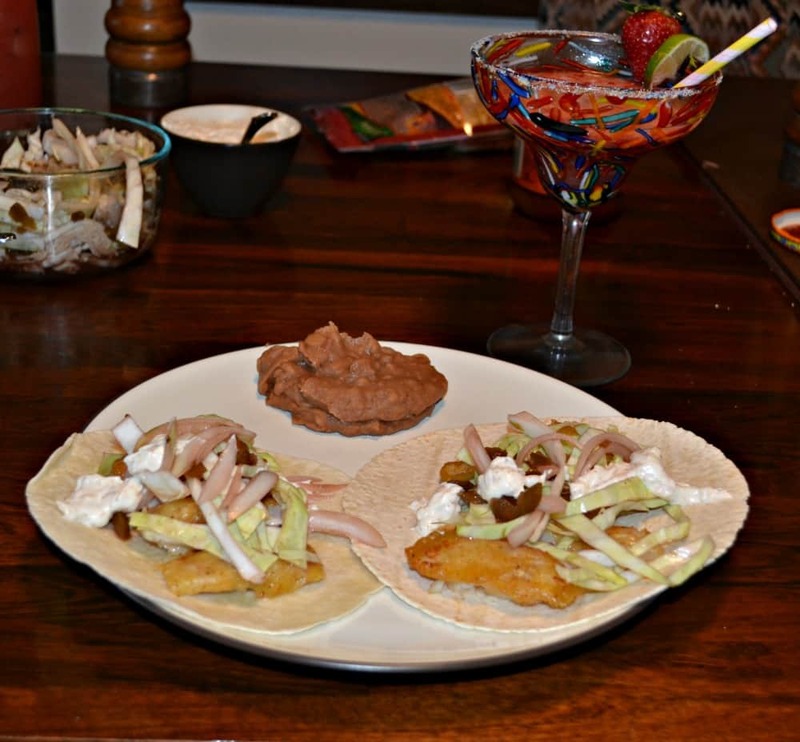 I’m sold on these fish tacos and will be making them a lot this summer with the fresh produce from our CSA. 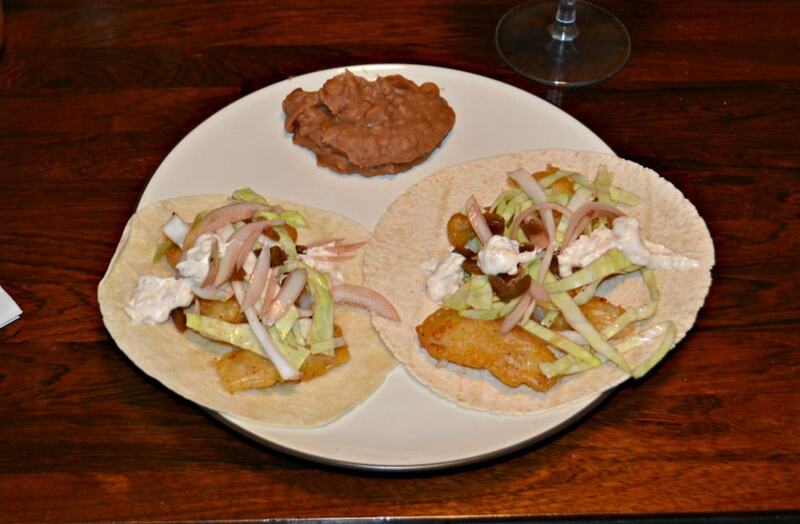 Crispy beer battered fish on a tortilla piled high with pickled onions and cabbage then finished off with a creamy white sauce. To make the pickled onions combine the onions and jalapenos in a medium bowl. Set aside. Place the vinegar ,lime juice, sugar, and pepper in a small saucepan and bring to a boil. Remove from heat and pour over top of onion mixture. Allow to sit for 30 minutes. Refrigerate until ready to use. 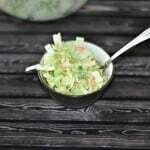 To make the cabbage, take ¼ c. pickling liquid from the onions and toss in a bowl with all the ingredients for the pickled cabbage. Toss to coat. Refrigerate until ready to use. To make the white sauce simple whisk all ingredients together in a bowl and refrigerate until ready to use. Preheat the oven to 225 degrees. Set a wire rack inside a rimmed baking sheet. Set aside. Sprinkle the fish with salt and pepper and set aside. In a medium bowl combine the flour, cornstarch, and baking powder. Add beer and whisk until smooth. Add the fish pieces to the bowl and toss until the fish is coated. Add the vegetable oil to a deep skillet. Heat over medium high heat to 350 degrees. Remove the fish from the batter, 4-5 pieces at a time, allowing excess batter to drip off. 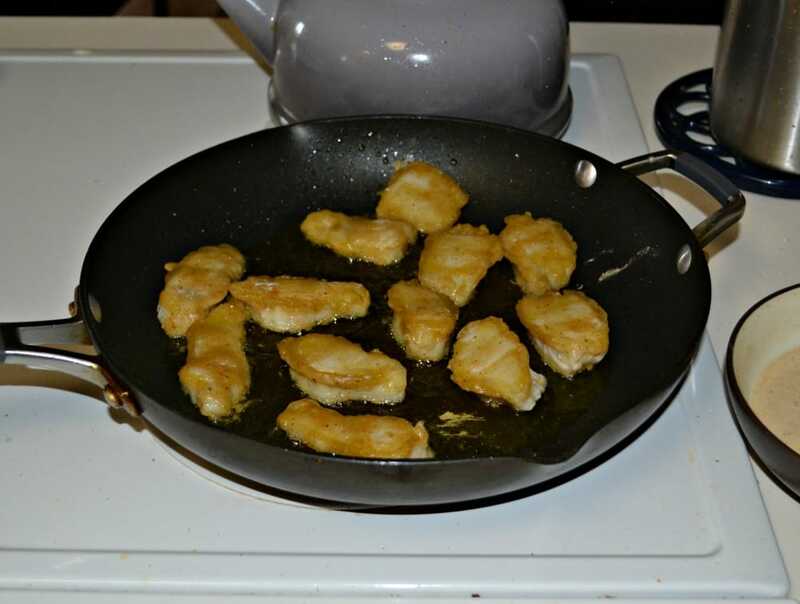 Add the fish to the hot oil and fry for 2-3 minutes per side or until golden brown. Remove from the pan and place on wire rack on the baking sheet. Place in the oven to keep warm. To serve the tacos place a few pieces of fish on a tortilla. Top with pickled onions and cabbage. Drizzle with white sauce and sprinkle with cilantro.